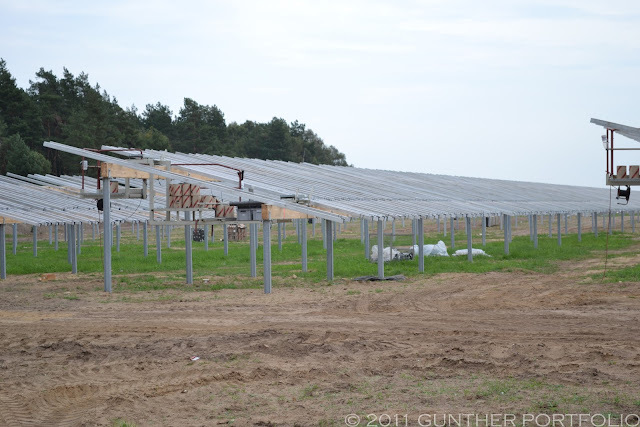 Exclusive Photos of the 70 MWp (MegaWatt-peak) photovoltaic (PV) Plant under construction. When I mapped my driving route to the 26th European Photovoltaic Solar Energy Conference and Exhibition (26th EU PVSEC), I thought about possible side trips on the way to Hamburg. The BELECTRIC project in Alt Daber, first discussed in BELECTRIC begins construction of 70 MWp Photovoltaic Plant with Energy Storage, ranked at the top of my list. My plans were set once I determined an Alt Daber excursion would only add about two hours to the journey. Upon arrival, I found a cleared tree path with views of the northwest corner of the project (please see the View point pin shown on the Google Map) near the town of Alt Daber. 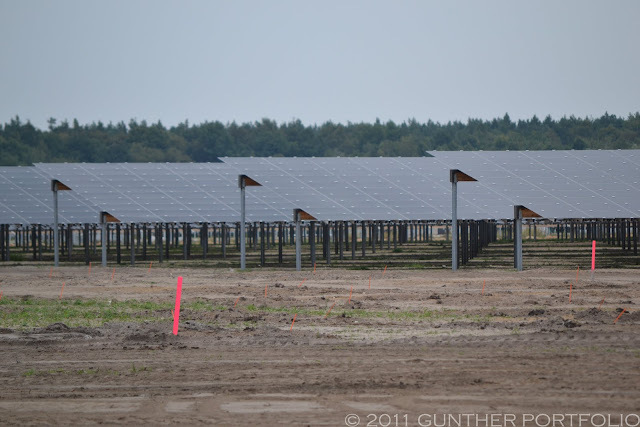 However, the perspective was limited and only the backsides of the installed southern facing modules were visible. 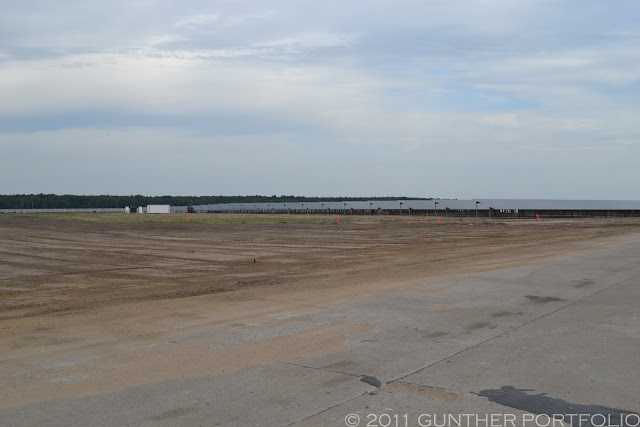 Backtracking, I drove to the Alt Daber-PV Next Generation project entrance gate hoping to at least sneak a few photos. Since there were no project views from the gate, I approached the security person on duty and asked if it was possible to take a few photos or if there were other places around the project with views into the old airfield. To my surprise, the security person checked with an onsite coworker if it was OK for me to take some photos and permission was granted for me to drive escorted to the airfield! I understand an open house planned for the same weekend had been delayed one week. 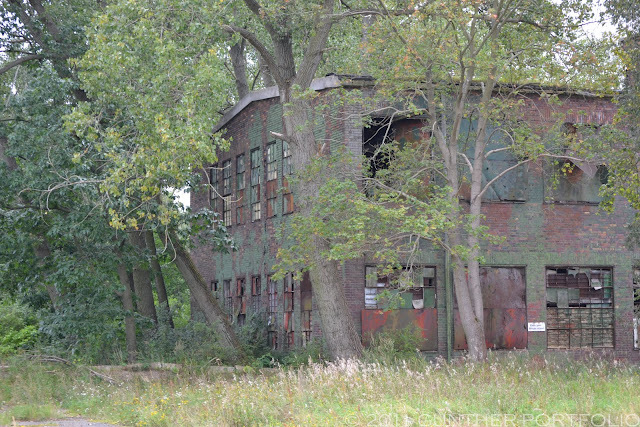 I followed the entrance road, and, after a turn to the left, abandoned base buildings greeted me on both sides of the road. 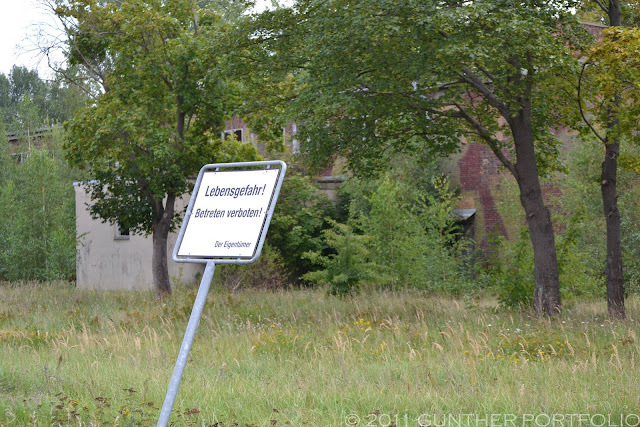 Signs proclaiming “Lebensgefahr! Betreten verboten!” or “Danger! No Trespassing” were real reminders the site was a former military base and visions of old ordinance kept my car on the road like rails. Told to stop about one fifth of the way down the south runway (please see the Alt Daber airfield pin shown on the Google Map), I opted to get out of the car to snap my photos. 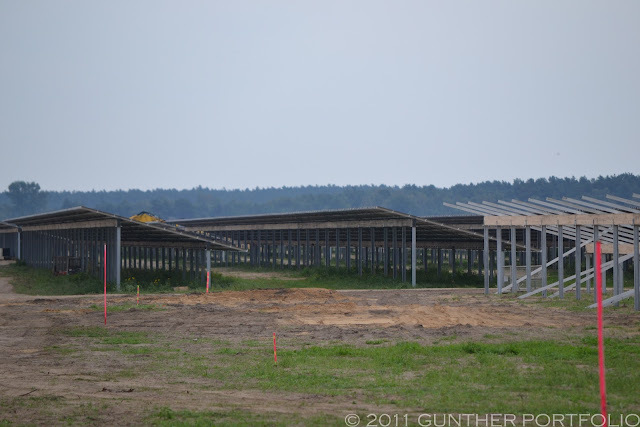 As far as I could see eastward, First Solar, Inc. (NASDAQ:FSLR) modules adorned the signature BELECTRIC racks with wooden crossbars. 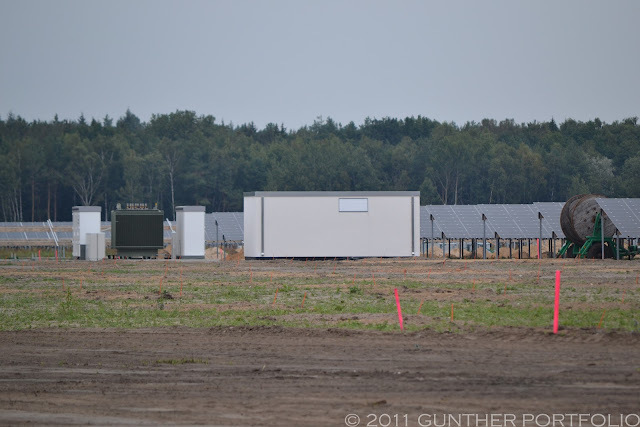 To the north, the BELECTRIC central inverter station appeared to be similar to the 2.0 MegaWattBlock design announced at Intersolar 2011. Two SMA Solar Technology AG (ETR:S92) SUNNY CENTRAL type inverters flanked what I understand is a grid integration transformer. I believe the SMA inverters are custom built to BELECTRIC specifications. I thought the trailer building was a PADCON GmbH “Utility-Grade Power Management Unit with active grid control and ADIA interface”, but it may just have been a construction trailer. Though the project access I had was impressive, I continued to search for a keyhole to view the eastern side of the project in order to determine the percentage completed. However, my time limited search was fruitless. 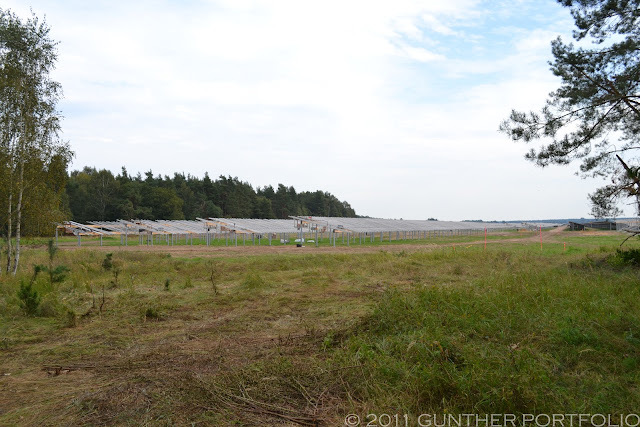 Later, I contacted BELECTRIC who told me 32 MW had been completed thus far or almost 46% of the project. I don’t know the name of the fellow shown below, but he must be cataloged on the The beetle fauna of Germany by Christoph Benisch website somewhere. 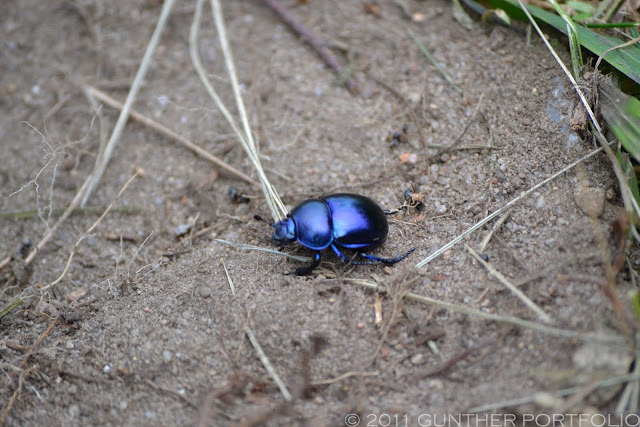 I was startled when the beetle flew away while I was absorbed in my attempts at macro photography.